The 72 metre motor yacht O’Pari3 has been sold with Matt Albert at Yachting Partners International acting for the buyer and seller. She is the 160th largest yacht in the world and the 5th largest brokerage motor yacht to have been sold in 2016. Delivered in 2015 and built for an experienced owner in steel and aluminium to a design by Studio Vafiadis, O’Pari3 is the second largest yacht to come from Greek yard Golden Yachts, with an impressive volume of 1,708 GRT. 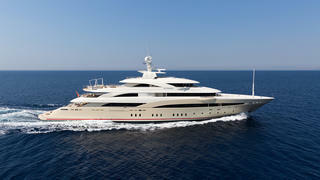 O’Pari3 can accommodate 20 guests in eight cabins including three owner's suites. The first owner's suite is found forward on the main deck and boasts a private balcony, the second is forward on the upper deck and the third owner's cabin is aft on the bridge deck and enjoys access to a private aft deck. In addition, there are two VIP cabins on the main deck and three additional guest cabins span the main and upper decks. All cabins have state of the art entertainment centres and en-suite bathroom facilities. She offers extensive deck space for relaxing and entertaining as well as a generous spa-pool lounge, complete bar with barbecue station, a fully equipped gym, steam room, beach house and a touch-and-go helipad. Twin Caterpillar 3516C diesel engines give her a cruising speed of 17 knots. Originally a highly successful charter yacht, her new owner will be using the yacht privately. O’Pari3 was asking €70 million.